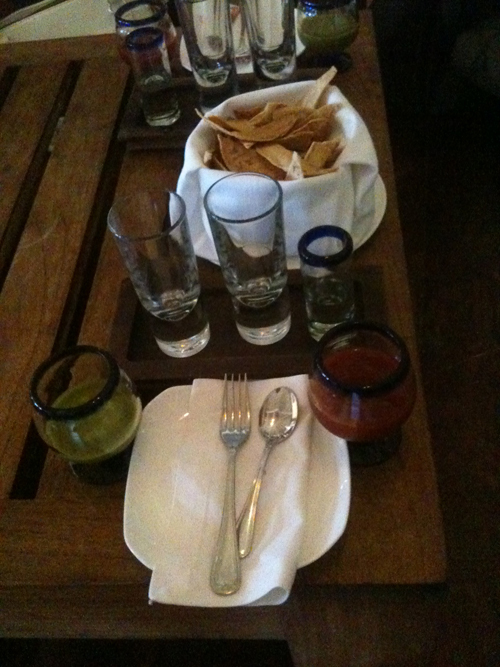 I came to Riviera Maya for a food, wine and tequila tour, but we hadn’t gotten to the tequila. 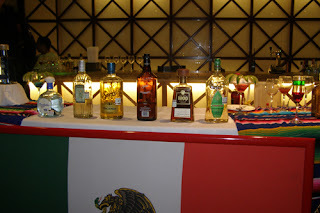 That all changed on the third day as we finished our Tulum tour with a tequila tasting at Hacienda Tres Rios Resort. 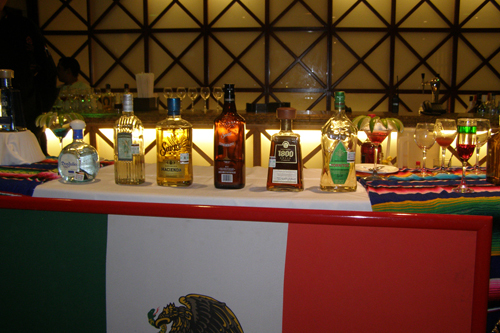 The Food and Beverage Manager of Hacienda Tres Rios, Oscar Orbe Quiroz, led our tasting seminar. It wasn’t just something he did for us, but a course the resort’s guests get to take each week. I have to say it was one of the best I’ve had for any spirit. He explained the basics about tequila being made from the blue agave plant grown in Jailisco, and the difference between the kinds of tequila – white, silver, resposado, anejo and aged. 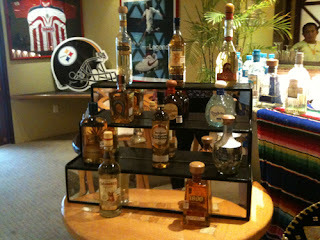 We started with Don Julio White, a sweet and mild spirit. Next, it was 1800 Silver, with a hint of color and a touch of green apple in the taste. The Sausa Reposado showed caramel and vanilla from the toasted barrels and the Sausa Tequila Anejo had the taste of both wood and aging, making it almost like Scotch Whisky. As someone who tends to favor the white spirits the first was my favorite, but I certainly appreciated the complexity of the reposado tequila. The tasting finished with a lesson on making (and tasting) Sagrita, a Mexican mixer that is made of orange, lime and tomato juices; salt, pepper, soy sauce, worschestire sauce and Tabasco. It is not mixed with the tequila, but drank after it. Before we left we got to sample an expensive, aged tequila, Herradura Seleccion Suprema, full of sweetness and oak, and smooth as can be. After we toured the Tres Rios Resort, which is on a 326-acre nature park, we headed back to Grand Velas Riviera Maya for some work time before dinner. It was a quiet dinner for myself and three of the other writers, David Hammond, Kristine Hanson and Anna Cavaliere, at Piaf, a wonderful French restaurant at Gran Velas Riviera Maya. 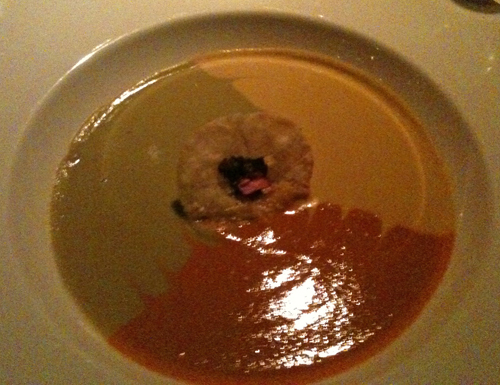 Chef Michel Mustiere’s presentation was beautiful throughout, but the Crème Tricolore was magnificent. It was a trio of soups – Pumpkin, Pea and Tomato – in one bowl, divided in thirds. The chef suggested I try each individually, then tasting a mixing by swirling from the middle, where there was Mushroom Duxelle Crocant Scented with Thyme Blossoms! I don’t use the word magnificent often to refer to food, but this certainly was. After I got a good night’s sleep, I walked to the main resort to check out the buffet breakfast for the first time. I enjoyed the display of every kind of fruit imaginable, with some yogurt and a croissant. I spent the morning writing and organizing my photos while most of the group was at Xcaret. I also had an hour at the infinity pool, looking out at the beach and enjoying the quiet before the Riviera Maya Tourism van picked myself and the rest of the group up to go to The Tides, a nearby resort that’s about to have a huge expansion. I should clarify that statement as “huge” is not an appropriate description of this boutique property that will only have 41 villas when renovations are complete. I met up with the group for a tequila and ceviche tasting. It was a bit more informal than the one the previous day, with a focus more on eating (for those of us not allergic to seafood). I heard the ceviche was excellent and I enjoyed the Caprese Salad with Pesto and the Macacita (rolled tortilla filled with cheese) with Caramel Sauce. Marcos, The Tides’ restaurant supervisor who teaches these classes to hotel guests, also introduced us to a Green Sangrita, which I highly recommend. This drink is made from green tomato and pineapple juices; chili sauce and salt. It was a perfect combination of sweet and salty to highlight the tequila. Fortunately, we had a few hours before we were to eat again because there was a big meal planned for the whole group. 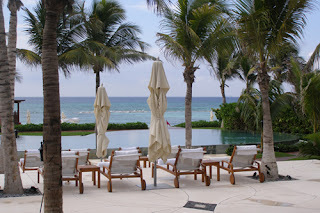 It was our farewell dinner at Grand Velas' Frida, before most of the writers would head home and I would be off to Secrets Maroma.